I'm not the biggest banana fan, but I love me some banana bread! I tried out a new recipe today and it turned out great. 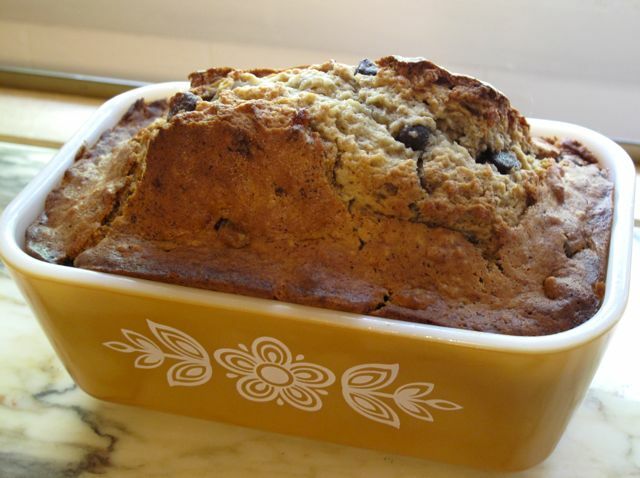 I actually had to halve it because I only had two bananas — luckily I have a super-cute mini Pyrex loaf ovenware! This is a quick and easy bread to make and it's pretty foolproof as well. Keep in mind that this is more like a spice cake (think chai latte), and less like a traditional banana bread. It's not too sweet and is perfect with coffee or tea. Preheat oven to 350 degrees. Lightly grease a 9x5 inch loaf pan with butter or nonstick cooking spray. In a large bowl, combine flour, baking soda, salt, and spices. In a separate bowl, cream the butter, vanilla, and brown sugar together. Stir the eggs and mashed bananas into the wet mixture until well blended. Slowly add flour mixture into wet mixture, and then add the nuts and chocolate chips (stir just enough to moisten). Pour batter into the loaf pan. Bake in preheated oven for 60 to 65 minutes, until a fork inserted into center and comes out clean. Let bread cool in pan for 10 minutes, then using a butter knife, slide it out onto a wire rack to cool. I enjoyed a slice paired with some French Press Ritual Coffee in my I ♥ Michigan mug while we watched Clueless! Today was a good day.